Delivered Denver 29/10/43; Gr Island 9/11/43; Assigned 550BS/385BG [SG-G] Gt Ashfield 18/11/43; returning from mission to Conches with Tony Gaguarelli, Co-pilot: Bill Laughter, Navigator: Jim Garvey, Bombardier: Ed Dressen, Flight engineer/top turret gunner: Ed Pilny, Radio Operator: W.M. Morris, Ball turret gunner: F.W. Fuller, Waist gunner: Russ Howser, Waist gunner: W.A. 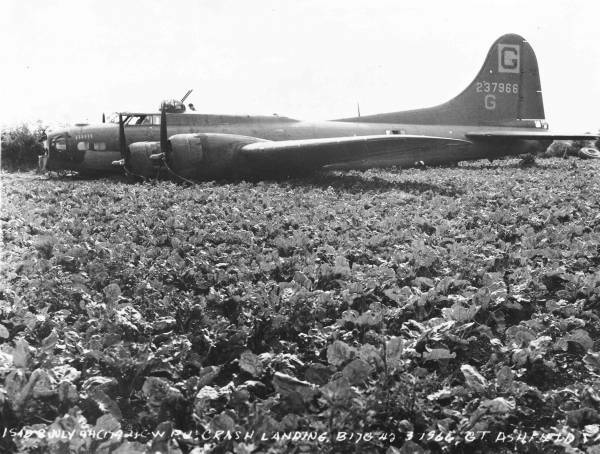 Smith, Tail gunner: Marcel Rousette (10 Returned to Duty); crash landed at edge of airfield 8/7/44, killed Alf Ruddock, a farmer worker in the field and Frank King slightly injured; sal battle damaged 10/7/44. SWINGING DOOR.